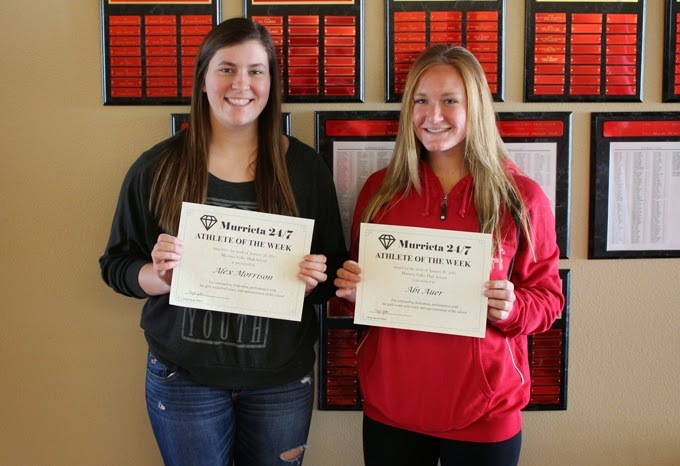 Alex Morrison (left) and Abi Auer are the Murrieta Valley High School Athletes of the Week. Senior water polo player Abi Auer is a four-year member of the varsity water polo and swim teams. She is one of the most versatile athletes competing this winter sports season. Alex Morrison represents the girls basketball team, which is 17-3 overall and one of the area's top teams. In her first game back from injury, she scored a game-high 18 points with eight rebounds, a block, assists and two steals in a 44-36 win over Temecula Valley. These athletes will be eligible for selection as Murrieta Valley High School's Athletes of the Month, which will be announced in early February.